Chevrolet India has discontinued the sales of all of its products in India effective December 31, 2017. Its Indian facilities will be utilised for export markets only. 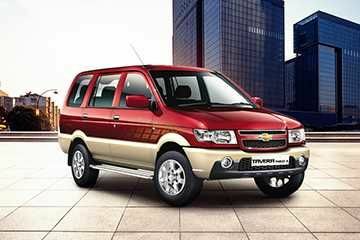 Its Chevrolet Tavera MPV used to come with two engine options. A 2.5 litre turbo diesel engine and a 2.0 litre TDCi diesel engine (with VGT) which was sourced from Sonalika. There’s no getting around the fact that the Tavera is a dated product. It’s a multi-purpose vehicle with the basic essentials and if all you want is a comfortable vehicle that can seat 7-10 occupants, while munching mile-after-mile, the Tavera is a gets-the-job-done option. However, it is better suited to fleet operations, as, for its price, there are better options available if you’re looking for a family car. Spacious, practical and comfortable interior. Diesel engine offers good low-end torque and highway driveability. Average overall fit, finish and build quality. The Tavera is over a decade old and it shows its age. Lack of equipment. Basics like ABS or airbags aren’t even optionally available. The claimed ARAI mileage: Chevrolet Tavera Diesel is 13.58 kmpl. General Motors that stopped the production of its flagship MUV Tavera in India few months back, has now started to reproduce the vehicle after getting regulatory approvals.